Flagship Scale the Heights event. Multi-stage fitness competition with accessible standards throughout designed to get as many people as possible to a live event enabling novices and more experienced competitors to compete against each other. This year we extend our invite to the wider fitness community. Standards will include Olympic lifting, body weight movements, kettlebell techniques and military inspired standards to name just a few possibilities. Expect everything. All the standards are based around our story ‘Milo’s Revenge’, and you are part of the story. Music written to match each chapter, illustrations, videos and even a soundtrack available via iTunes Summer 2016 bring our story to life. This is more than a fitness event, this a community driven interactive experience and only one price for all competitive stages! Your ticket buys you your place and Wodcast ID to complete the three online qualifiers in May. The top 90 placed individual participants (45 male and 45 female) and top 15 male and 15 female masters are guaranteed invites to the second round events. The remaining 234 second round places will be randomly drawn as special Wild Card invitationals from the remaining top 350 runners up for the individual category and top 45 masters category. We will make phone calls to the offer the Wild Card places during our Wild Card Week. Get through one of the 4 semi final events at either Slough or Leeds and compete in the Grand Final at Reebok CrossFit Reading on 11th September. Then join us for the UK’s first national invite after party Scale the Night at Sub89 Night Club Reading following the final. One price for all stages of the competition, more opportunities to be part of something special, so get involved and celebrate your fitness! This is no ordinary fitness competition. 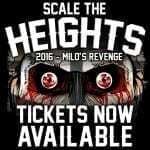 Welcome to Milo’s Revenge ….. In 2015, 1200 athletes came together from across the UK and Europe to battle for the right to be crowned Kings and Queens under the mountain. It was an epic battle that saw a community gather at sold out live events in 4 different venues where we witnessed the formation of new allegiances all in the name of fair play and shared suffering. Then trophies were awarded to the victors. However, the trophies were not ours to give. They were taken from Razorstorm Island, site of the ancient Viking ship wreck Amarth, homeland of the beast Milo and his army of evil Viking Monkey Minions who only fear the angry Bear that wanders the hostile territory. When angered the beast can only be appeased by the sounds of his twisted metal guardians King Leviathan. The beast has awoken and he wants his trophies back, so he has sent his minions to the mainland dragging our champions back to his island to meet their bloody fate. Our champions Sam Parkin, Simon Wilson-Storey, Amanda Jones and Lea Watson lie helpless, awaiting your help. It’s our job to assemble an army to rescue our champions bringing together old and new friends, calling back Wildcards who fell at the online qualifying chapters and taking them with us for another chance to tackle Milo’s challenges, driven on by our DJ Luke Veillet. Milo wants to see you suffer. You have been warned! But survive the qualifying chapters, the live semi finals and the grand final, either as a competitor or supporter and make your way victorious to an after party to end all after parties at Sub89 Reading after our final battle. Here we will experience the Milo’s Revenge soundtrack played out live by Milo’s guardians King Leviathan, followed by a killer DJ set from Benji Webbe, pioneering front man of the world famous Skindred. Fitness never rocked this hard! Train together. Party together. One Community.